What an evening - a winter storm is blowing through -- the wind is howling, there are things rattling throughout the house that defy explanation, the dogs are whimpering and growling at some unseen presence in the backyard. Its very much a "qouth the raven, nevermore" kind of night - the dark skies parting for the nearly full moon, the tapping and rapping on the window lattice. 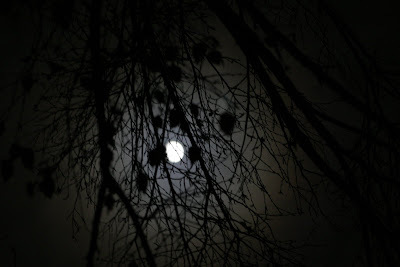 This night has a very peculiar beauty all its own - a hint of terror and a sky flushed with moonlight and wayward leaves. The dogs and I will seek refuge in sleep -- huddled together tightly against the tempest that rages outside. The mysteries of the natural world never cease to amaze me. Goodnight Moon. Sounds beautiful in its own way.